232 Clarendon is located on the west side of Clarendon, between Commonwealth and Newbury, with 234-236 Clarendon to the north and 230 Clarendon (109 Newbury) to the south. 232 Clarendon was built in 1872 for Uriah H. Coffin, a building contractor, probably for speculative sale, on land which he purchased from Newton Talbot on January 1, 1872. 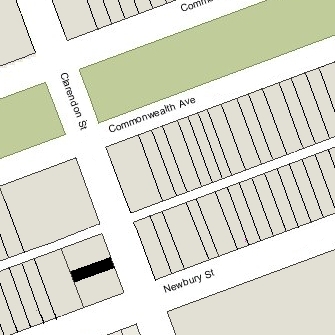 The lot for 232 Clarendon – with a 19 foot frontage on Clarendon — was part of a parcel running between Newbury and the alley that Newton Talbot had purchased from the Commonwealth of Massachusetts on May 16, 1871. 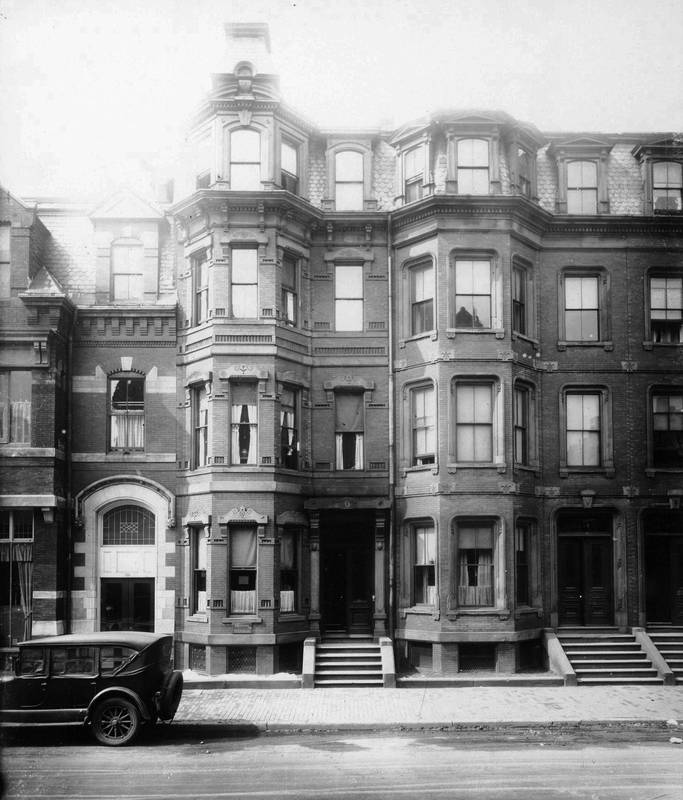 That same day, he sold the southern portion – with a 48 foot frontage – to Isaac Sweetser, who resold it to architect Charles Amos Cummings, who built 230 Clarendon as his home. Newton Talbot retained the northern portion of the original parcel, with a 45 foot frontage, and had 234-236 Clarendon built on it. He and his wife, Calista (Clement) Talbot, made 236 Clarendon their home. When Newton Talbot sold the lot for 230 Clarendon to Isaac Sweetser they entered into an agreement requiring that the houses built at 230-236 Clarendon were to be set back 7 feet 6 inches from the property line on Clarendon (with exceptions for stairs, porticos, cornices, and bays) and could be no deeper than 56 feet. The agreement also limited the height of structures in the rear yards and specified that there was to be a four foot wide passageway at the rear of the lots at 232-234-236 Clarendon to provide access to the alley. Click here for an index to the deeds for 232 Clarendon. On August 10, 1872, 232 Commonwealth was purchased from Uriah Coffin by Hannah Elizabeth (Bradbury) Goodwin, widow of George Clinton Goodwin. In 1870, she had lived in Charlestown. Hannah Bradbury Goodwin was a novelist. She published at least three of her books while living at 232 Clarendon: The Fortunes of Miss Follen (also called Christine’s Fortune) (1876), One Among Many (1884), and Our Party of Four – A Story of Travel (1887). George Clinton Goodwin had been a manufacturer of extracts, compounds, and drugs. Hannah Goodwin was his second wife (his first wife, Jane Pearson, had died in October of 1855). Hannah Goodwin’s step-daughters, Caroline L. Goodwin and Georgiana Jane Goodwin, lived with her at 232 Clarendon. On July 8, 1874, Hannah Goodwin transferred the property to her step-son, Charles Clinton Goodwin, and attorney Augustus E. Scott as trustees on her behalf. In January of 1879, Georgiana Goodwin married to Oscar Brownell Mowry, an attorney. 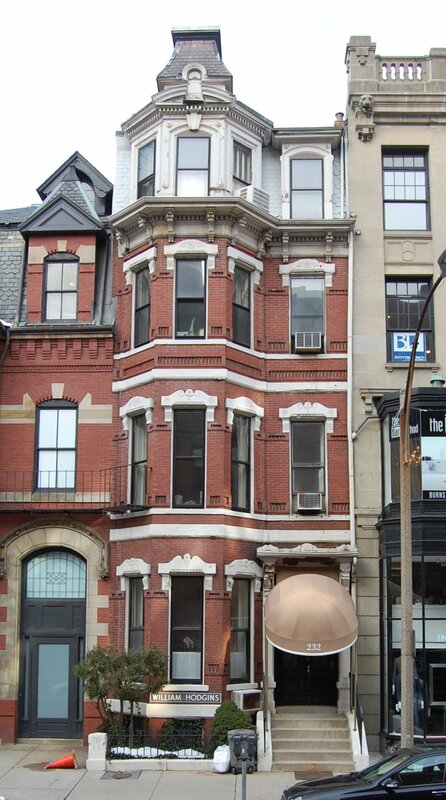 After their marriage, they lived at 232 Clarendon with Hannah Goodwin, but moved to Brookline by 1881. 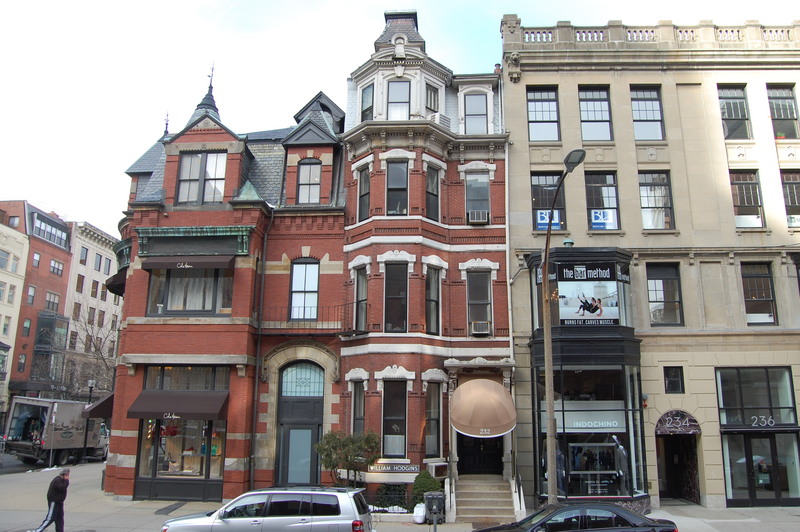 Hannah Goodwin continued to live at 232 Clarendon during the 1887-1888 winter season, but moved thereafter to 281 Newbury. On May 29, 1888, 232 Clarendon was purchased from Hannah Goodwin’s trustees by Sarah Goodwin (Joy) Dixon, the wife of Dr. Robert Brewer Dixon. He was a physician and also maintained his medical offices there. They previously had lived and he had maintained his office at 7 Park Square. Robert Dixon’s cousin, Dr. Lewis Seaver Dixon, an ophthalmologist, also maintained his offices at 232 Clarendon (he previously had maintained his office with Robert Dixon at 7 Park Square). Lewis Dixon and his wife, Ellen Rebecca (Burrage) Dixon, lived at 258 Newbury. By 1913, the Dixons also leased office space to several other physicians. In the mid-1920s, the Dixons were joined by their daughter, Eleanor (Dixon) Booth, widow of Frederick O. Booth, and the Booths’ two children, Louise and Robert. In 1920, prior to Frederick Booth’s death, they had lived in Brookline. Eleanor Booth continued to live with her parents until about 1937, when she moved to Dover. 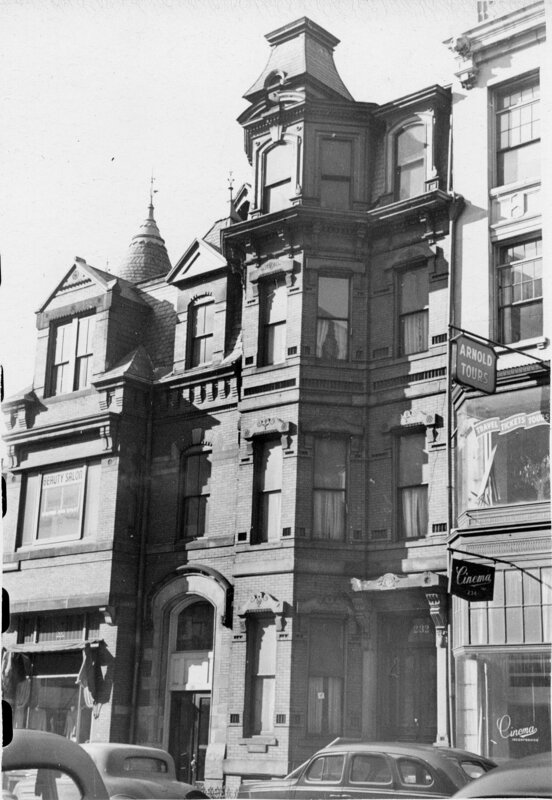 Louise and Robert Booth continued to live with the Dixons at 232 Clarendon until the early 1940s. On June 17, 1943, 232 Clarendon was purchased from Sarah Dixon’s estate by a trust established by Mary Bryant (Pratt) Brandegee, the wife of real estate dealer Edward Deshon Brandegee, for the benefit of their children. The trust also owned 230 Clarendon. By 1944, 232 Clarendon had been converted into a retail store (Miss Cardinal’s Hats owned by Agatha Regine Cardinal) and residential units. By 1949, it was entirely commercial. On August 17, 1965, 230 Clarendon and 232 Clarendon were acquired from the Brandegee trust by William J. Fitzgerald and Ann B. Fitzgerald, trustees of the Fitzgerald Investment Trust. The properties subsequently changed hands and on March 31, 1966, were acquired by Guthor, Inc.
On April 29, 1969, the City Bank & Trust Company foreclosed on the mortgages given by Guthor, Inc., and sold 230 Clarendon and 232 Clarendon to Richard L. Wing and his wife, Frances T. Wing of Malden. On January 2, 1970, the Wings transferred the property to Richard Wing as trustee of the Lee Realty Trust. On July 12, 1973, 232 Clarendon was acquired from the Lee Realty Trust by William Lewis Hodgins, a noted residential interior designer. In October of 1973, he filed for (and subsequently received) permission to convert the property from a store and offices into a store, offices, and two apartments. 232 Clarendon remained remained his interior design studio and offices in 2016.